A 3D mouse for Photoshop? Last month, we wrote an article about 6 accessories you can buy to improve the way you use Photoshop. One of the least used is the 3D mouse; many people never used or heard of it. Because of this, we asked the company if they could send us one to review and they were very happy to do so. Read our thoughts on it and learn how it can benefit your Photoshop workflow! Have you ever tried moving/rotating 3D objects? It’s a lot more complicated than it could be. With a regular mouse, you’re constantly switching between the 6 different 3D move modes. But with the SpaceMouse Pro, you can use the controller cap to move in 6 axis without having to change between any of the 3D move modes. It makes rotating 3D objects much easier and faster and easier than using a mouse. Moving 3D objects with a mouse involves using 6 different 3D move modes. The 3dconnexion SpaceMouse Pro lets you move 3D objects in 6-axis without having to switch between any of the 3D move tools. Using the controller cap on 3D mouse is like reaching out to move the object with your hands. Screenshot from 3Dconnexion’s website. The SpaceMouse Pro has a controller cap (the main part) along with several sets of buttons. The controller cap lets you rotate and move your 3D objects as if you were directly holding the object in your hands. Starting from the top of the device, the four buttons on the top are programmable keys that you can customize with one of the many preset commands. You can also record a chain of keystrokes for it to playback; just like the macro keys in gaming keyboards. I have mine set to undo/redo and increase/decrease speed. To the left of the controller cap are four modifier keys and a menu button. Your left hand sits over these keys and it’s easy to press the buttons with your pinky or ring finger. These keys are handy to have because they let you hold down the modifier keys without taking your right hand off your mouse. Unfortunately in Photoshop, modifier keys aren’t used much for 3D work. Holding the shift key while moving usually contrains the movement to one axis; this doesn’t happen with the controller cap. One way to get around this is to enable the “Dominant” option in the 3Dconnexion properties which will limit the movements to one axis at a time. To the right of the controller cap are the QuickView keys. They’re supposed to let you change between the different viewing angles quickly, but only the Fit button worked with Photoshop. This is very unfortunate because it’s extremely useful and works very well in other 3D software. I even tried recording Photoshop actions to change the camera angle, hoping to map the keys to those Photoshop actions, but it didn’t work because Photoshop recorded the X, Y, and Z position which meant that it wouldn’t work for other documents with different width/height dimensions. All is not lost because these keys can be programmed for other functions/hotkeys. 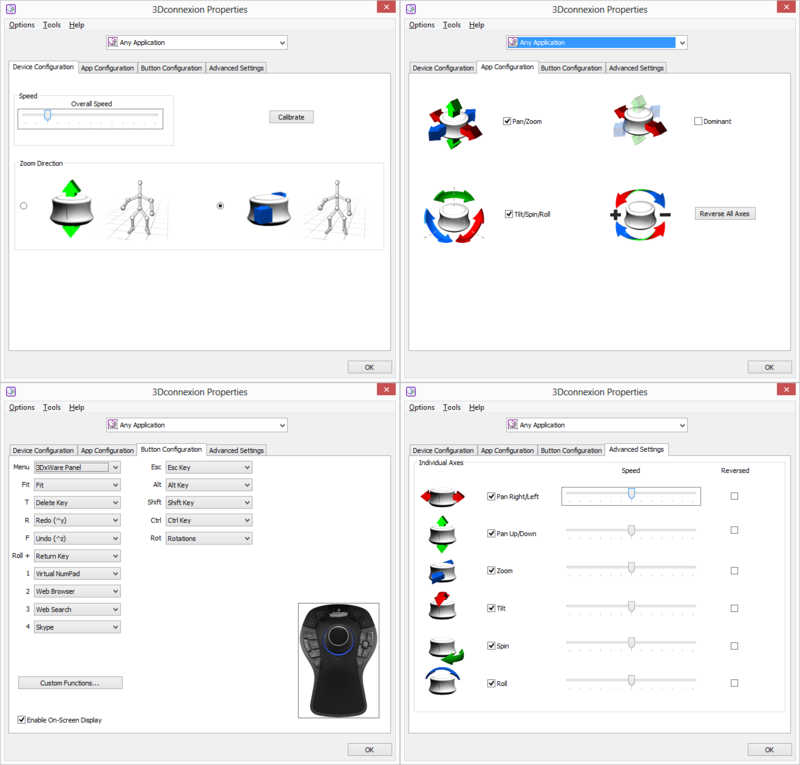 The 3Dconnexion Properties has a large list of settings that you can adjust. It covers everything from turning on/off the blue light to setting programmable buttons for the keys. You can also customize the buttons with the macro key recorder. It records a chain of keystrokes just like the macro keys in gaming keyboards. So how good is the SpaceMouse Pro with Photoshop? It’s excellent, but with some caveats. I’m back here to say thank you for the great review. I bought a 3D Mouse Pro and it is amazing! I’m very happy with the build quality and finish. It looks as nice in person as the photos in your review. Super blog and its awesome..
You can easily learn Photoshop various program and you can develop your Photoshop skills hare. Super Pots mi hermano , me fascina tu trabajo que realizas…quiero saber donde puedo comprarme uno como estos en España.. Does this work with games too? Are you sure this works with photoshop cs6? I looked at the supported software page and it only supports up to cs5. And a google search shows that people can’t get it to work with cs6. Hmm… you’re right. It does say CS3 – CS5 on the 3Dconnexion website. The forum posts are old and the latest drivers DO support CS6. It even has a specific plugin file for Photoshop CS6. I think it’s just outdated info on their website. This is really a note-worthy positing.